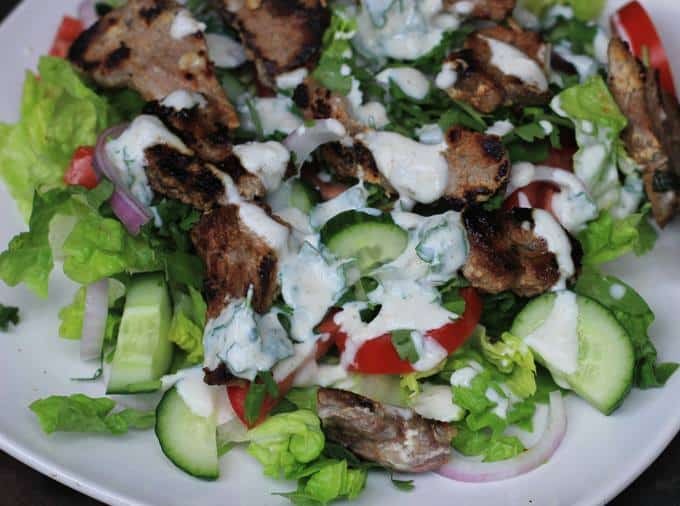 I recently came across this Greek lamb salad recipe on the Diabetes Queensland Facebook page. The puzzling thing was that it included two slices of bread and low fat yogurt. It seemed bizarre that this meal would be recommend for diabetics who are effectively intolerant to significant amounts of carbohydrate. The analysis below shows that this meal would have 22g of net carbs for a 500 calorie serving and a total insulin load of 51g which is significant. So I ran a comparison to see what would happen if we dropped the bread and used full fat Greek yogurt instead of the low fat option in the original recipe. The result was that the insulinogenic percentage dropped from 41% to 34% and lo and behold both the nutritional value and amino acid score on NutritionSELF improved, without the “healthy whole grains”. It is interesting to see how much the nutritional value improves when we remove the bread, even though we’re told that we need grains for nutrition. As you can see below we get a massive drop in the net carbs from 22 to 10g when we drop the bread. There is still a substantial insulin load, however this is mainly from the protein which would cause a much gentler blood sugar rise. But how could we improve on this recipe even further? I tried adding a smidge more olive oil, dropped the lean lamb protein back a bit and added a couple of boiled eggs which gives us an even better nutritional profile as shown below. More fat. More fibre. More nutrition. More taste! As always great post Marty. The corollary to this post is individuals adding copious amounts of butter or oil to a meal to make it more “Keto”. Nothing drives me more crazy that people supplementing with fat to reach some level on a keto-meter.